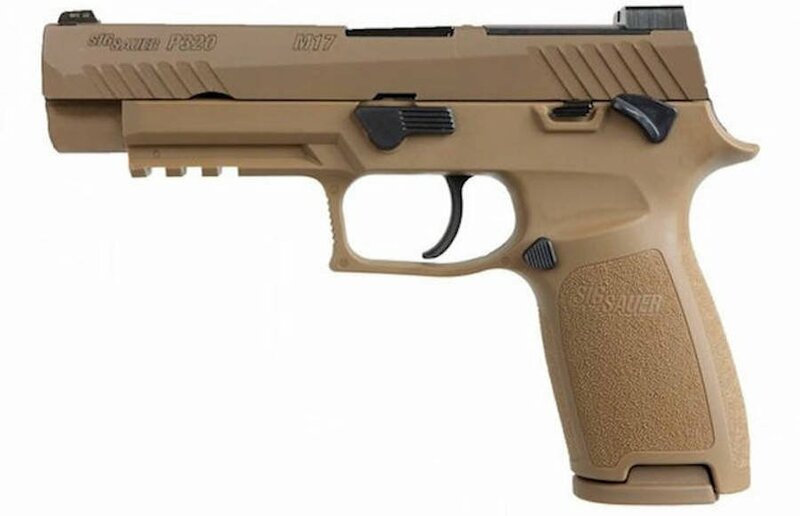 The civilian version of the U.S. Army SIG Sauer M17 will have the Model Number P320-M17. This combines the previous civilian version Model P320 and the modified U.S. Army MHS selection M17. The SIG Sauer P320-M17 is not simply a recycled Model P320. The modularity requirements of the Army’s MHS bid required several changes to the original P320 design. The P320-M17 brings all of those modifications to the civilian market, to almost exact specifications as the Army’s new M17 pistol. The U.S. Army MHS program was rigorous, lengthy, and some have argued way too complex and expensive for a pistol selection. 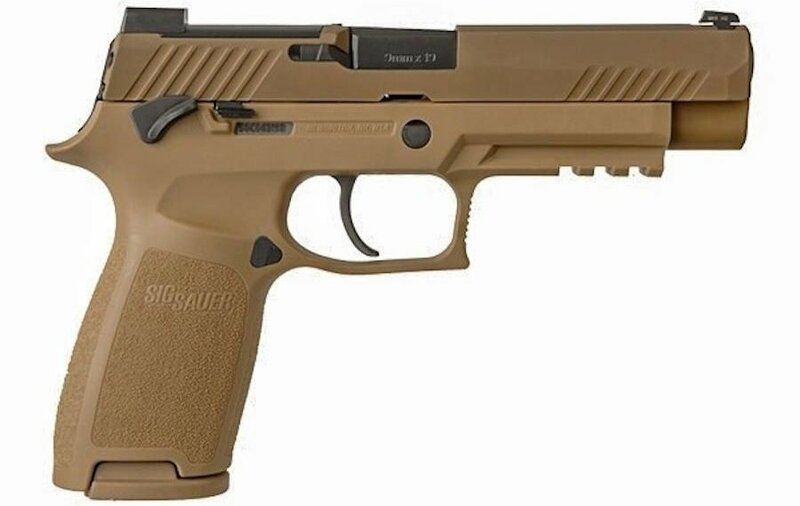 Regardless, the Army did finally select the SIG Sauer M17 submission to be the new handgun for our soldiers. Some early concerns quickly rose over the P320/M17 failing some drop tests. Videos arose of the P320 being able to fire if dropped, or firing if tapped a little too hard at the back of the slide. Though very concerning, several of the videos did show drop tests that exceeded the requirement of the Army MHS. Since then, SIG Sauer has offered a complete retrofit of P320 pistols at no cost to owners, that supposedly has eliminated the problem. SIG Sauer P320-M17 offers ambidextrous controls. The SIG Sauer P320-M17 offers the same modularity as the M17. Caliber changes can be achieved by simply switching slides, barrels and magazines. Modularity was the most important requirement of the Army MHS program, and is an important consideration for a military handgun. In battle, ammunition supplies can vary wildly. In addition, many of our allies use different firearms, and sometimes in different calibers. Being able to quickly transition a firearm to fire ammunition from our allies is an important feature. The P320-M17 is a striker-fired action, another MHS requirement, that has proven to be one of the most reliable and yet simple action designs. The original U.S. Army M17 was almost completely FDE in color, including the controls. This included the take-down lever, slide stop lever, manual safety, magazine release button, and trigger. 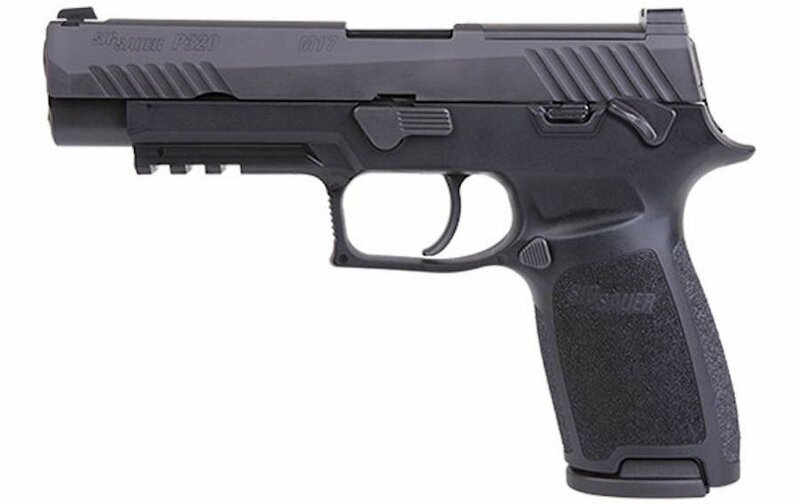 However, the civilian P320-M17 SIG Sauer has been provided black controls, just like the current M17 handguns. In some ways this provides a more stark and attractive appearance than the all tan colors. Other than these minor changes, the civilian P320-M17 will be an exact replica of the Army’s M17 pistol. Currently, SIG Sauer is only offering the P320-M17 in the full-size configuration. However, I would expect the sub-compact versions to be released in short time – perhaps an announcement at SHOT Show 2019. The full-size P320-M17 has two options: the coyote tan PVD coated pistol similar to the M17, and the “Bravo” version in more traditional black. The P320-M17 has the same stainless steel slide and optic cut, and will feature the same SIGLITE night sights. This includes the removable rear night sight plate, that allows the addition of popular reflex optics. The P320-M17 will also offer the same (3) grip sizes available to the M17, a feature becoming more and more common with polymer-framed pistols. Each pistol will come with (2) 17-round magazines. Current P320-M17 pistols will have the external manual safety lever, but SIG Sauer has promised a non-manual safety version is on the way soon. The SIG Sauer P320-M17 Bravo is the more traditional black version. The BlueSheepdog Crew have had the opportunity to shoot several SIG Sauer firearm, including the P320. SIG Sauer pistols have wonderful actions, and are some of the smoothest running firearms available. The trigger on the P320 is a little longer, and perhaps heavier, than a Glock or Smith & Wesson M&P trigger, but it is smooth and reliable. The trigger breaks crisp, and there is a tactile and audible reset. If there is one drawback to the new SIG Sauer P320-M17 it is the price tag. SIG Sauer firearms are famously more expensive than their competition. Some of this price difference is well-earned, as SIG Sauer refuses to compromise on quality, and produces simply amazing firearms. I’m sure the civilian market will flock to the new P320-M17, but I wonder if SIG Sauer could have made a stronger impact with a price tag around $600 (like Glock, and even less for S&W). It’s not like they could not accomplish this, as the Army M17 was delivered for right at $300 per pistol! Did SIG Sauer deliberately underbid the MHS submission (at cost or even a loss), with the intent to gouge the civilian market later to make up for their losses with the Army? Perhaps bigger distributors will be able to offer the P320-M17 for less. Time will tell, but I’m still sure civilians will flock to the Army’s new pistol.